Today is the best day of your life - because yesterday is already gone, and tomorrow is still not here. How will you make a difference? How can you make sure that by the end of today you feel proud and accomplished by how you've lived the last 16 hours? ​This short visualization exercise with Anastasia will help you do that. Simply leave your email below - and you'll get instant access to it (plus, I will send you more exercises and coaching tips once a month). Download your daily practice visualization now! Visualization is a bit like meditation though – everyone talks about it, but no one is sure how to do it in the “right” way, and it’s much easier with a guidance. Also, when you are practicing visualization by yourself, your “saboteurs” start kicking in. To help you plan your year, I have recorded this guided visualization exercise. To get your free 20-minute guided visualization exercise, simply leave your name and email below! Get your free guided visualization now! According to the positive psychologist Barbara Fredrickson, if your ratio of positive to negative emotions is more than 3:1 (and less than 11:1), you have enough internal resources to cope with any difficulties. Positive emotions help us build up resilience for hard times, but sometimes they are difficult to notice or generate, as their are much quieter than negative ones! 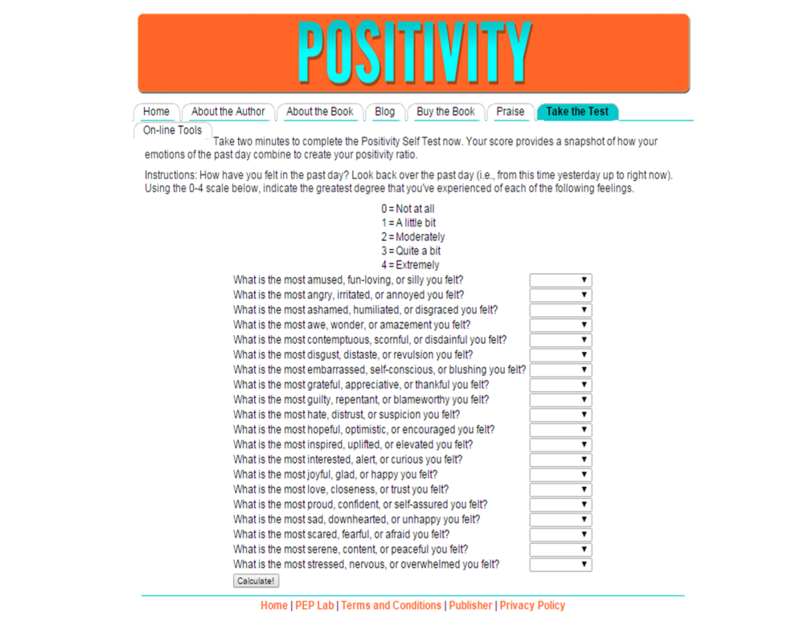 Here's a great free online tool that helps you track your daily positivity level and only takes 2 minutes per day. Answer all the questions in the test at the end of each day. Make sure you reply honestly and don't try to guess what the result will be! Write down the score in a notebook and leave it until tomorrow. After a week, review all the scores - you can do it by yourself, with your mentor or coach or your close family member or a friend. Make sure the ratio of positive to negative emotions is 3:1 or more on most days to have a life you deserve! If it's not the case, think of what you can do to change that! Perhaps, start by reviewing what you spend your energy on every day? This circle represents eight most important areas of a person's life. Eight is a randomly picked number, and you can change the number of sections and their titles, depending on what you believe is important to you. You can use this tool to check whether your life is balanced and set up the priorities. This is the tool that almost every coach would use at the beginning of their work with a client to identify the key areas that need improvement - and you can use it yourself, too! 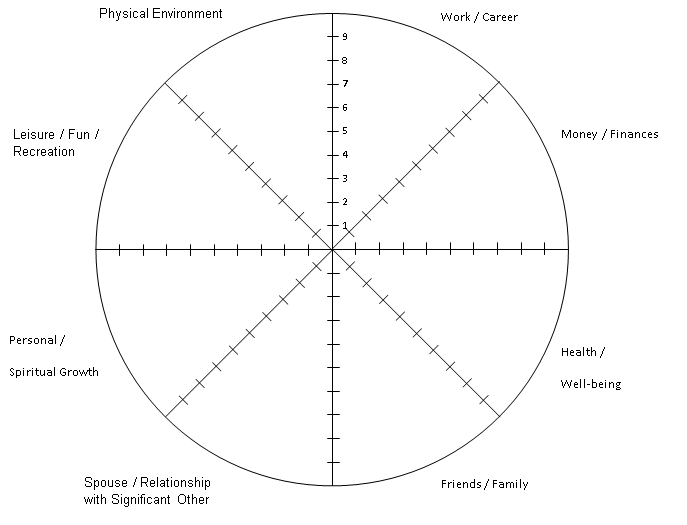 Put a line in each segment of the circle according to how fulfilled you feel about one particular aspect of your life. Zero (in the centre) means that you are absolutely not happy with this area and 10 means it cannot be better. What does your figure look like? Does it look like a wheel, or more of a fortress with sharp edges? Your ‘wheel of life’ cannot roll if it has sharp edges, so if the gaps between different areas are big, chances are living an unbalanced life and loosing energy in some of its areas that score low. Now, look at the marks. Are there any areas of your life that scored below 6? What are they? What needs to happen so that they become an 8 or a 9? How about 10? Write it down. What are the key 2-3 areas of your life that you need to focus on in the next few weeks and months? Write them down. Finally, what is one practical step that you can take today that will make a little change to one of those areas? Say, you only scored 4 on health and you have issues with your lower back. Perhaps, you could finally go online and look up a good osteopath? Write it down, tell somebody you trust you are going to do it – and do it! Let your life roll smoothly! Have you recently been procrastinating on something important? Have you been promising yourself to rewrite your CV, get more clients or finally start running in the morning, but it’s just not happening? As a coach, I get clients all the time who ask me to help them stop procrastinating on something that’s important for them. I have got together the most typical cases of procrastination at work and in business here specially for you! If you want to make friends with your procrastination and make it serve you, rather than struggling with it, scroll down to download for free my Ten ultimate tips to fight procrastination! When you are done, you can download the pdf version of Anastasia's Ten ultimate tips to fight procrastination. These tips are easy to follow, and the best bit is that you only have to pick and follow ONE tip out of TEN to keep your life moving!